Gluten Free Dairy Free Chocolate Fondue! This post is linked to Simply Sugar and Gluten Free’s Slightly Indulgent Tuesdays! The guests – The Kelly’s, the amazing family behind the adventures in The Adventures of a Gluten Free Mom. The reason – a stopover for the Kelly’s along their journey from New Mexico to (sunny and cool) San Diego. The fun (for the kids) – Lego building, typical boy horseplay, all things Star Wars, swimming after dark, and a mini virtual bowling tournament. The fun (for the adults) – toasting to new friends in real life, good libations, great conversation, and the realized camaraderie that each of our 6 year olds and each of our 3 year olds are almost too alike, especially in their affinity for “potty talk”. The Dietary Restrictions – Gluten (them and us), Dairy (them and us), Sunflower Seeds (us) and Soy (us). The Menu – Shirley’s – gfe –gluten free easily – Cucumber Bruschetta with an adaption of mango salsa, Vegetable Root Chips with I am Gluten Free’s Smoky Aioli Sauce, Rice crackers with a tomato basil hummus and smoked salmon, Leek Risotto, from the Gluten Free Goddess, my Zucchini Fritters, my Dairy Free Pesto Crusted Chicken (recipe coming soon), and for dessert (for which this post will focus on)… Gluten Free Dairy Free Chocolate Fondue (with a variety of dipping goodies for accompaniment)! Before I get on with the dessert, I just want to say that we had such a great time with the Kelly clan. Heidi is an amazing woman and so determined to change the way Celiac Disease and Non-Celiac Gluten Sensitivity are diagnosed. I can just tell by meeting her in person that she is going to be responsible for some big changes to come. And for all of you that are going to be meeting her when we are at IFBC (The International Food Blogger Conference), you will love her and be drawn to her immediately – I know I was! Okay, so on with this fondue. I just have to say, up front, that I never expected that a Dairy Free version of Chocolate Fondue would turn out so well. But, apparently, substituting out the heavy cream in my usual recipe with Non-Dairy Mimic Crème produces the most amazingly smooth and creamy chocolate. According to their site, “Mimic Crème is the non-dairy, non-soy, gluten-free substitute for cream that truly is both tasty and healthy.” The picture above is of their sweetened version (which is the one that I used in the fondue). They also have an un-sweetened version of this. In addition, they have coffee creamers (which I have not tried) and a version of dairy free whipped cream called Healthy Top that whips just like real cream! I am thoroughly impressed with the results that this product has given me in a number of different recipes. I have used their unsweetened version in pasta dishes as part of a cream sauce, and I have used the sweetened version in a number of baked goods. However, I was hesitant when I decided to use it for the fondue because I was unsure of what the consistency would be like as I melted the chocolate – turns out, however, it was perfect. I will say that the only drawback is that all of their products are nut-based (they use a blend of Almonds and Cashews). Therefore, it is NOT safe for anyone with Nut Allergies! So, if nuts are an issue for you, definitely avoid this. Otherwise, I would highly recommend this product! 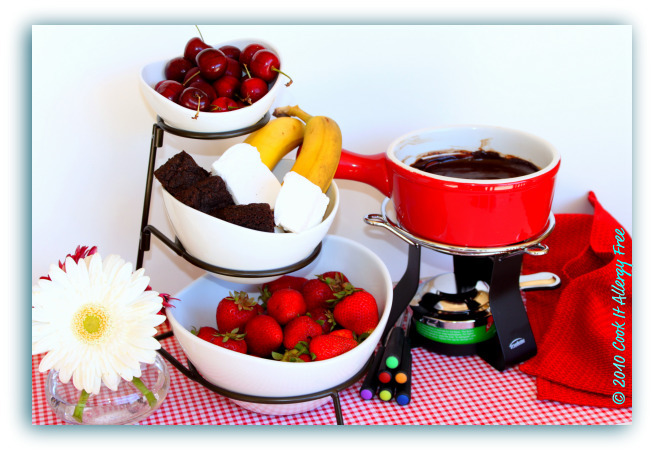 Chocolate Fondue – Gluten Free and Dairy Free! 1. Warm the Mimic Creme in a heavy bottomed pan until small bubbles begin to form and it comes to a very light boil. Then add the chocolate pieces and gently whisk until melted, smooth, and fully incorporated. 2. Immediately transfer to a fondue pot and keep it heated it with a low flame, or serve straight from the pot (but it will start to thicken and harden after a while this way). 3. Assemble all of your dipping goodies of choice and provide some utensils, such as fondue forks or bamboo skewers, to help you dip (or just use your fingers – especially amongst family)! Enjoy! What are your favorite things to dip into fondue? Give me some new ideas!! And a quick pick of our boys in mid-catch! You are so right about Heidi. I am impressed daily with the info she is getting out to folks. She’s relentless, too, which I just love. 😉 It’s wonderful to have “sister” advocates like the two of you. Shirley, I am sure you can totally use Coconut Milk, but we just recently got back some food sensitivity testing on Conner, and he came back sensitive to Coconut (amongst a few other things). I usually use Coconut a lot in recipes (and probably would have done so here, too) but now having to use alternatives to it! Thanks so much for the nice words!! Hmm..”sister” advocates – I like the way that sounds! Looks like we were reading each others posts at the same time. That fondue looks so tasty. I’ve been wanting to try the MimicCreme for a while. I will have to look for it. I also love the picture of the boys. So, cute. Oh, you have a summer. I’m jealous. We have barely gotten into the 70’s here this summer. But, I guess you don’t ever worry about not getting a summer in AZ. I think I am going to keep yours and Heidi’s blogs up constantly on my computer. The colors always make me smile. I wish I was going to IFBC. It sounds like it is going to be lots of fun. Yes, in AZ we do not ever wonder what our summer weather will be like! I’ll be anxious to hear what you think about the Mimic Creme. And on the note of blog colors, I would have to same thing about yours. The pinks and oranges look so warm and inviting! Makes me happy to look at them. wish you were going to IFBC too! Would so love to meet you. Maybe on one of my trips back to my parents in SF we will have to meet up! YUMMY! What a treat for them to have fondue – and fondue you can all eat. I am a little envious of your visit and even more envious of the conference. I so wish I was going! I would love to find this Mimic Creme and try it. I wish more cafes and restaurants would get away from soy, especially the sweetened soy milks! Thanks. Thanks so much, Maggie! I so wish you were going to IFBC – dying to meet you! I think that you can order the Mimic Creme through their site! It is not refrigerated until after it is opened – I know that is how Heidi got hers! OMG, you’ve made me blush!! You are much too kind Kim, thank you and I hope I can live up to half of your description of me, LOL! We had such a blast with you, Kurt and the boys. Luke asked for Carson for the duration of our vacation, “Are we going to Carson’s house today?” “I want some of Carson’s choc-oooo-late!” And Sam wanted to buy Conner 34 different sets of Legos at Legoland. He said Conner “gets it” with the fascination of Legos. Seriously though, everything you made was top notch and should be on the menu of a 5 star restaurant! I honestly can’t think of the last time I ate (and ate, and ate…) so well and feeling safe was a priceless bonus. From the beautiful and delicious appetizers (I bought some smoked salmon today so now I just need your tomato basil hummus recipe! ), the dairy-free pesto crusted chicken (I did not miss the cheese one bit), the Leek Risotto was perfectly creamy and the zucchini fritters I have been dreaming about for a week! So looking forward to the IFBC, we will have to plan on attending again next year so hopefully Maggie and Tia can make it too (or we will find a gluten-free spa somewhere, LOL!). Heidi, talk about making a person blush! Geez! I wonder what you would say then if my Mom cooked for you? LOL!! I feel like a complete novice next to her! We had such a fun time with you all! You are right – it is so wonderful to spend time with people who just “get” it! Conner has it in his mind that you will be coming over on your way back to New Mexico! I haven’t had the heart to tell him that you are already home! Every day, I feel so blessed that I have become part of this community. And I have said it many times before, but I will say it again. I think that this has been the biggest blessing for our family – not the curse that many think it would be! It has given us the opportunity to bring amazing people/families like yours into our lives, and it has truly changed the way that we look at our food forever!!! And IFBC is coming fast upon us! I am dying with excitement. I agree it will have to be an annual event (but I DO like the idea of a GF spa – Canyon Ranch has a pretty amazing one in Tucson)! And next year, Tia and Maggie better be on the list of attendees….hint, hint you two!! Hey Kimmie, I sure wish I was there to taste the yummie meal you served Heidi and her family. They sound like such amazing new friends. The needs in our lives sure shape our lives, and you are such a smart cookie putting all the right energy into it. You are so right that this lifestyle has become such a blessing for you, your family, and everyone that knows you. I am so so proud of you and the amazing example you are for all of us. Kudos to Kurt too – because of the endless support he gives you. 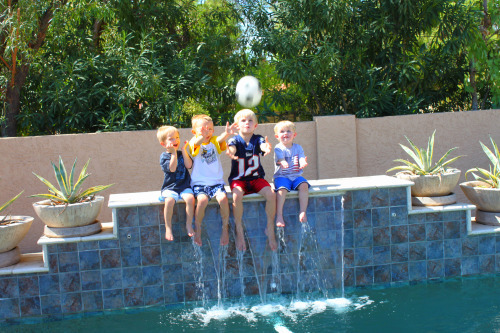 Love the picture of the boys at the pool. 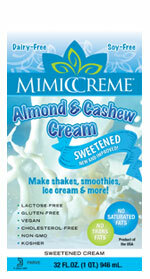 I want to do a fondue fountain for our not-really-a-wedding-reception bbq in October-and I just bought some MimiCreme! Now I need a fondue fountain…. Erin, too bad you are not near me. I have a totally cool one you could use! I did not bust it out for when Heidi’s family was here because it requires so much fondue to keep it going and we would have NEVER eaten that much!! But you can rent some for pretty cheap! How fun – a not-really-wedding-reception bbq…. I love it!! I just bought an inexpensive fountain yesterday at Target. It’s by Oster and was on sale for $39.99. Haven’t tried it yet, but Luke loved this fondue so much, I thought it would be fun to pull out on the weekends from time to time. I’ll let you know how well it works! Heidi, you will have to let me know what you think!! Amazon has a Wilton for $59.99 that’s gotten good reviews also that I was looking at. We have parties enough that I would be willing to purchase one if it was reasonable. And good tip Kim! Plastic, throwaway tablecloth under it for sure! I have used full fat Coconut Milk before in my Chocolate Fondue and it seemed to work just fine. I’d add a little cornstarch to help prevent it from separating and be careful not to heat it too much – do not let it come to a boil! is full fat coconut milk the one in the can? they also sell a coconut milk in a carton…. which did you use? Any other substitutions besides corn starch? healthier? So glad to have found this recipe and your blog. Yay for yumminess! Thanks for sharing. Can’t wait to try it for my Valentine’s Day party. Oh, and as far as dipping goes, I love your list. I think I will add some dried fruit as well.